.Check out and drive to Lake Nakuru National park at 0700 Hrs. Enroute pick up your packed lunch and proceed to Lake Nakuru budget hotel or similar for check in. Later check out and drive to Nakuru National Park for game drive. After breakfast, check out with packed lunch for the great migration experience. 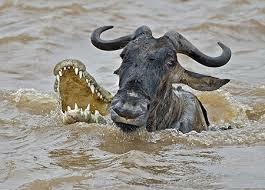 Spend the all day at the at the Mara River watching the Wildebeest Migration. Returning to your camp is late in the evening. Dinner and overnight at Mara campsite or similar. We check out with packed lunch after breakfast and spend the day at the at the Mara River watching the Wildebeest Migration. Thereafter you return to your camp is late in the evening. Dinner and overnight at Mara campsite or similar. We depart The Masai Mara game reserve is a fascinating ecosystem covering 1,500sq km of Savannah, grassland, woodlands and riverine forests. It is inhabited by the "Big five", as well as a diversify of other plain game and rich variety of bird life. and drive to Nairobi City to arrive mid day. Lunch will be provided at the carnivore restaurant before we transfer to your hotel or Airport for your flight back home.